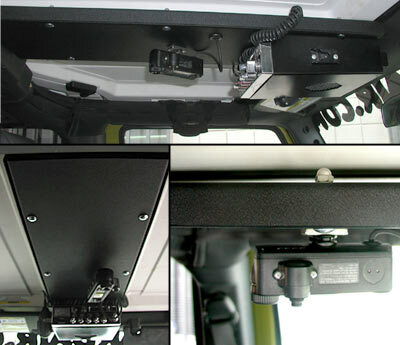 Burbank, CA - Made from 14 gauge steel with a black texture powder coat finish, the rack provides a secure overhead mounting platform for CB radios, extra lighting, or anything else you might want to mount up and out of the way while maintaining easy access. The design also incorporates a closed raceway section to route wires out of sight. Installation is simple and requires approximately 45 minutes and some minor drilling.